Egg pudding is my family's favourite dinner-time dessert. 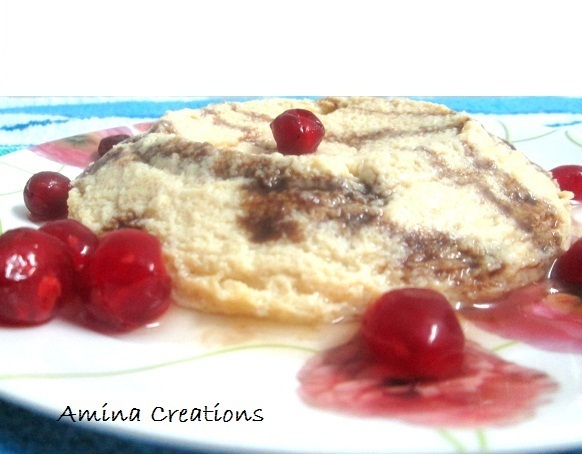 This time we thought of making the dessert more healthy and hence replaced sugar with Sugar free Natura. The dessert tasted delicious and we could eat it without worrying about calories. Boil milk in a pan, then reduce heat and continue cooking in low flame till the milk reduces to half its volume. You will now have 1 cup of milk. Allow the milk to cool down completely. Crack open the eggs in a bowl and beat with an egg beater till fluffy. Add sugar free natura and continue beating. Finally add milk and beat again. All ingredients must have been mixed well and the mixture should be completely covered with bubbles. Now take an aluminium pudding bowl and pour the mix into it. Take a steamer and place a ring at the centre. Place the pudding bowl over it and close a lid over the bowl. Make sure that no moisture or water enters the pudding bowl. If necessary place some weight over the lid. Carefully add water to the steamer such that it fills up to less than half the height of the pudding bowl. Then close the lid of the steamer (or idly cooker) and cook for about 30 minutes. Once done, open the lid, and check if the pudding is cooked. For this insert a knife, if nothing sticks to it on being removed, it is cooked. Once done take out the pudding bowl, allow it to cool, and then refrigerate it for at least 2 hours. For serving, pass a knife along the sides of the pudding bowl, place a plate on top and turn the bowl upside down. 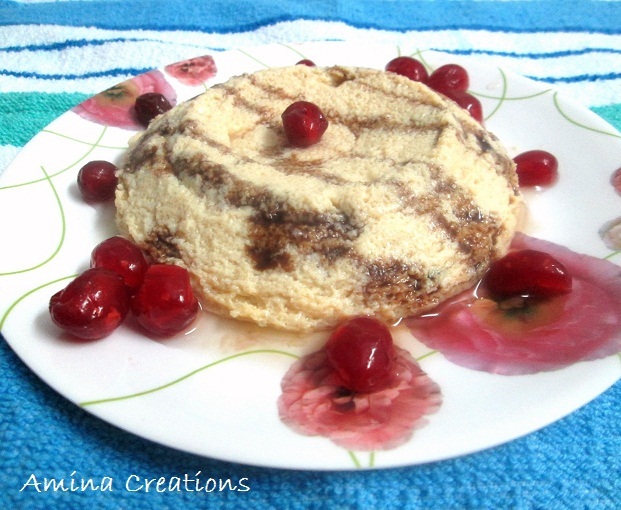 Drizzle chocolate syrup on top and garnish with red cherries. Cut it into slices and your Sugar free Egg pudding is ready to be served. 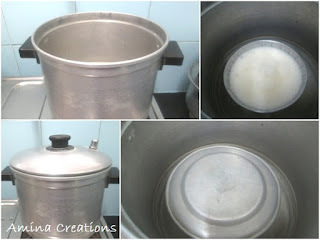 You can also use a pressure cooker or an electric rice cooker to steam the pudding. The only addition is to place a perforated plate at the bottom of the cooker. The procedure and cooking time is the same. The pudding can also be cooked in an oven. I was not very sure how much of sugar free natura I needed to use for the recipe. So I started with 20 spoons (the small spoon came with the bottle) and then checked for taste. Then I added more. This sweetness is according to our taste. You can increase or decrease according to your preference.